At the height of the Harlem Renaissance, photographer James Van Der Zee’s uptown studio became a site of fantasy and self-invention. In his 1920 photograph Eve’s Daughter, for example, an African-American woman embodies a joyful, edenic figure, standing in front of a studio backdrop that pictures an idyllic lake and trees. She wears a sheer wrap, with a wreath of leaves crowning her dark, upswept hair and sprigs of white flowers lying by her bare feet. Van Der Zee hand-etched marks onto the negative that detail the leaves and flowers, and that suggest a pair of swans in the water, further heightening the sense of some magical drama out in nature. 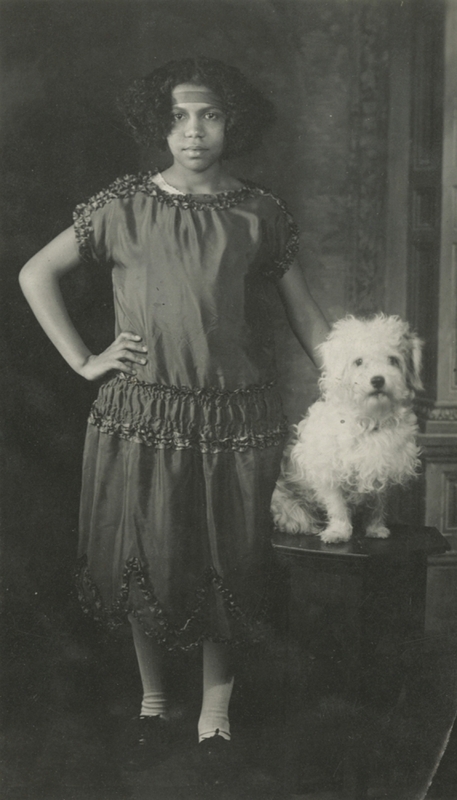 Van Der Zee, whose work is currently on view at New York’s Howard Greenberg Gallery through April 27th, became famous for taking glamorous studio portraits as Harlem’s culture blossomed. Yet he hardly set out to offer a documentarian’s lens on the era: He merely offered a service for people in his own community.As poets such as Langston Hughes lyrically translated the spirit of their times into verse, and as painters like Aaron Douglas created imagery of freedom on canvas, Van Der Zee used black-and-white film to herald a new era of African-American autonomy and creativity. Contemporary black photographers and filmmakers such as Dawoud Bey, Jamel Shabazz and Barry Jenkins have cited him as a major influence.